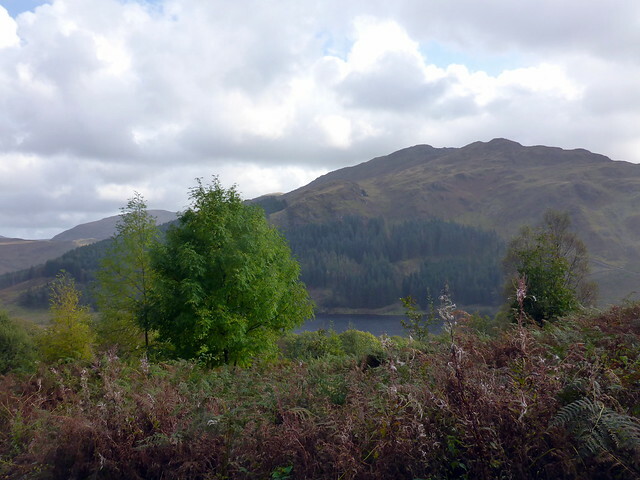 The plan was to head over to the south side of Loch Trool and climb up to Larg Hill - the final Donald of my first round, then across to Curleywee and find somewhere to camp. Weather was fine and sunny. 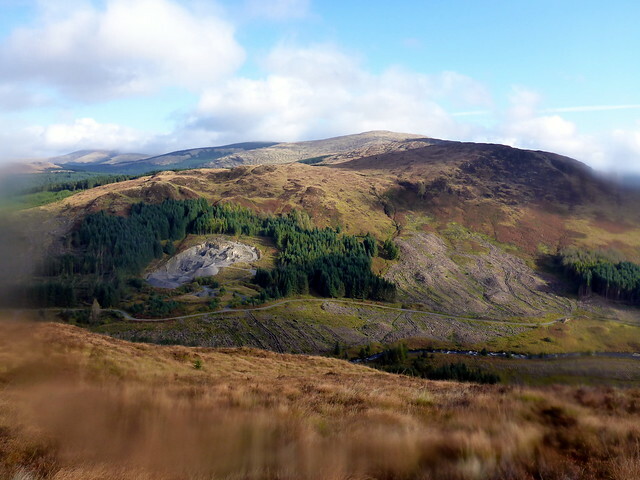 There's some forestry work going on around White Bennan, meaning I had to head a bit further on the path than I'd hoped. 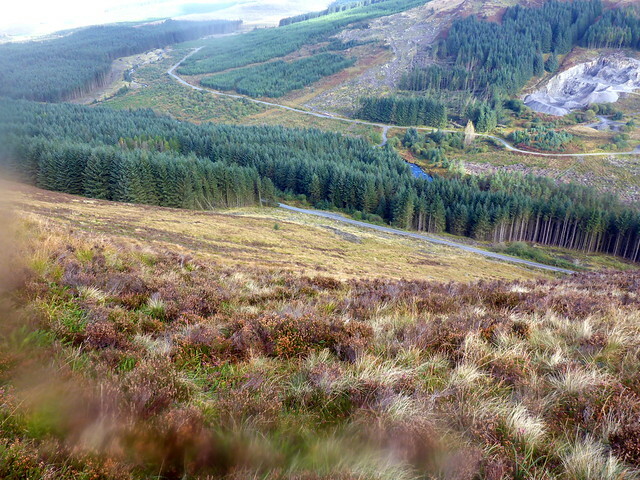 Ascent through a patch of forest was tough and spongy underfoot and I made slow progress up to Mulldonoch. 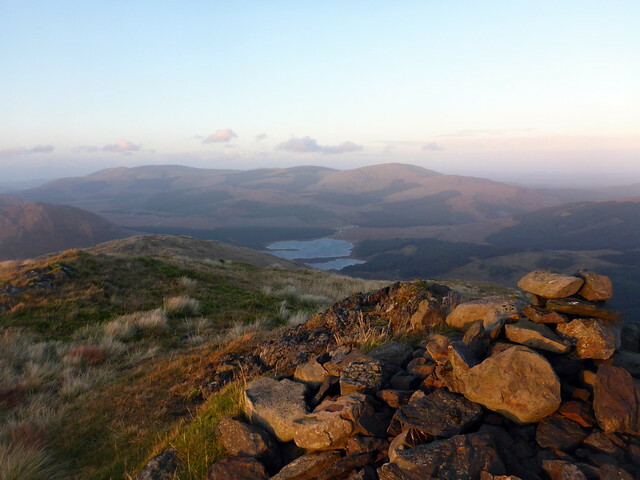 Thereafter things eased and it was a pleasant walk in the late afternoon sun across to Larg Hill then back to Lamachan Hill. 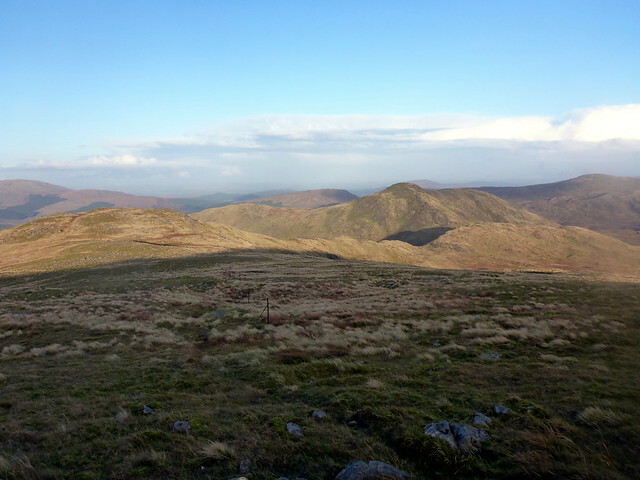 I could see Curleywee sticking up in the distance - I remembered it as a steep wee fellow, lots of scree. 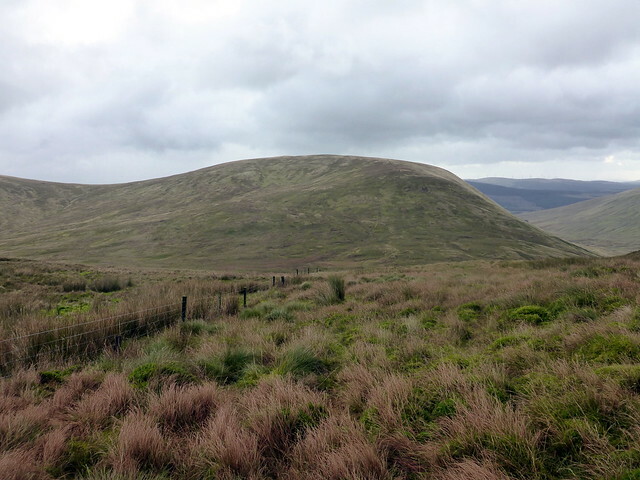 When I arrived there it was still quite green with vegetation and easy enough to ascend. The sinking sun turned the rocks a reddish gold and I began looking for a suitable spot to camp on the southern side of the summit. 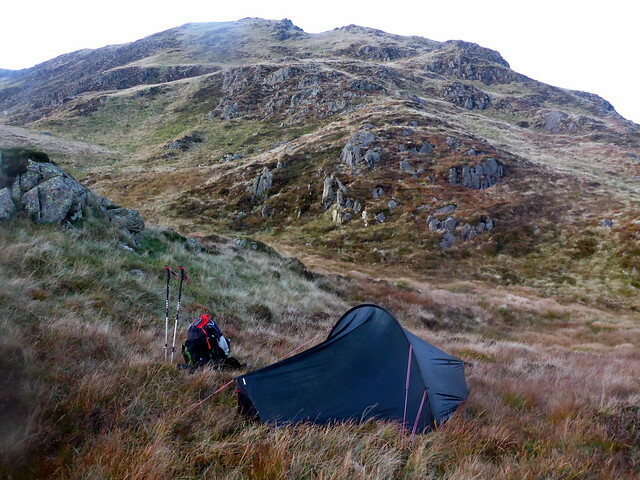 Managed to find an adequately flat, sheltered spot that wasn't too soggy and settled down for the night. 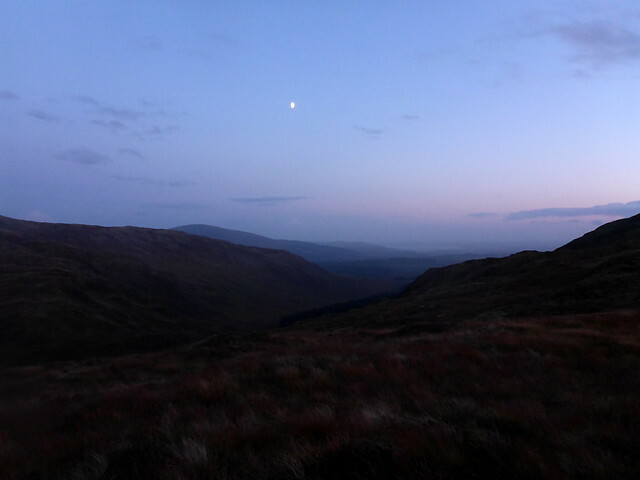 No dark skies as a fairly bright half moon shone brightly. Absolute quiet though - great! 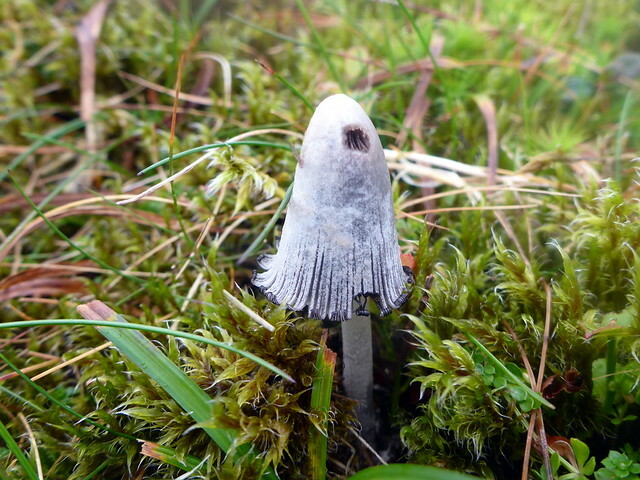 Saturday morning was shrouded in damp mist - I peered out at around 7am, groaned a bit and got ready to go. Not too cold thankfully. 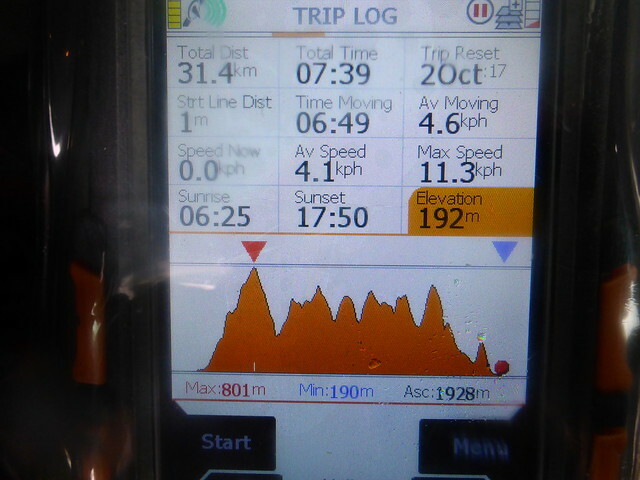 I had done a wee bit more than planned yesterday and hoped to get in at least 30k today as I knew the forecast for Sunday was grim. 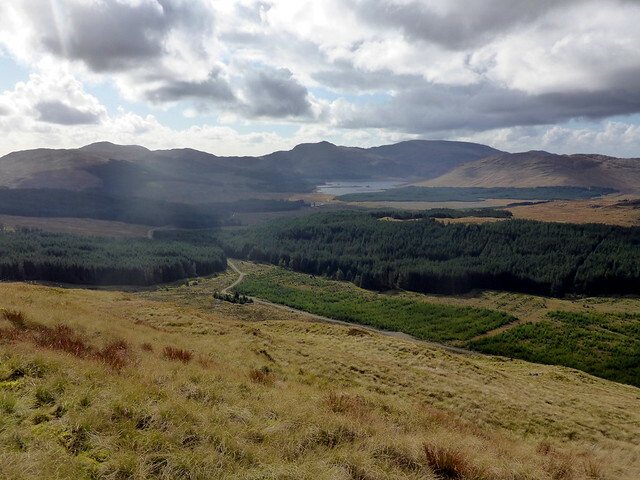 I picked a way down to the Loup of Laggan then over some craggy ground towards Millfore, the clag threatening to lift every now and then. 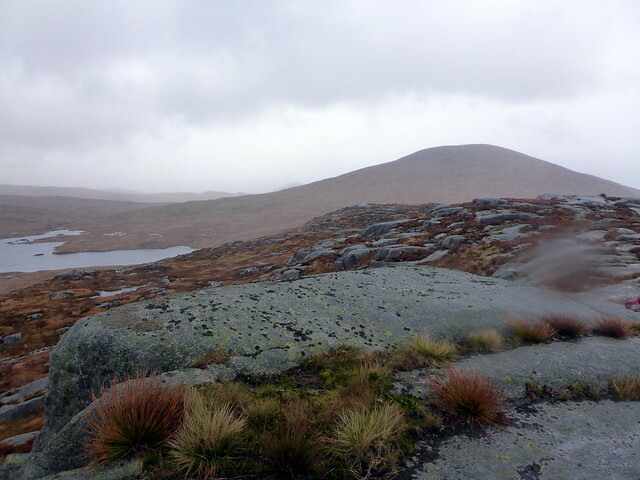 Across Loch Trool the line of hills from Craiglee to Dungeon Hill stood proud, reminding me of the ruggedness to come. 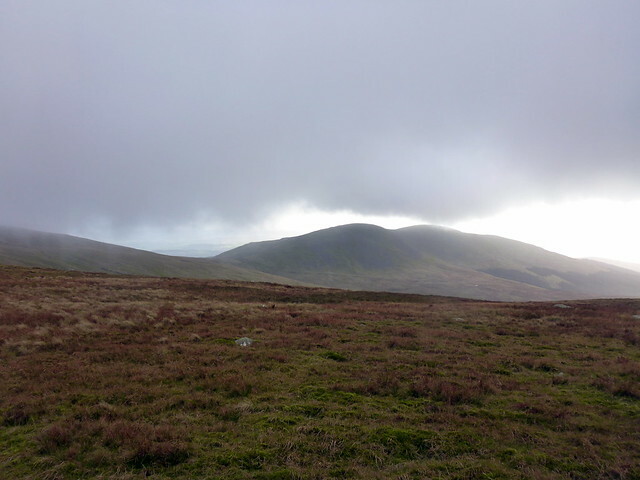 I was hoping to get to Mullwhuchur by the end of the day. 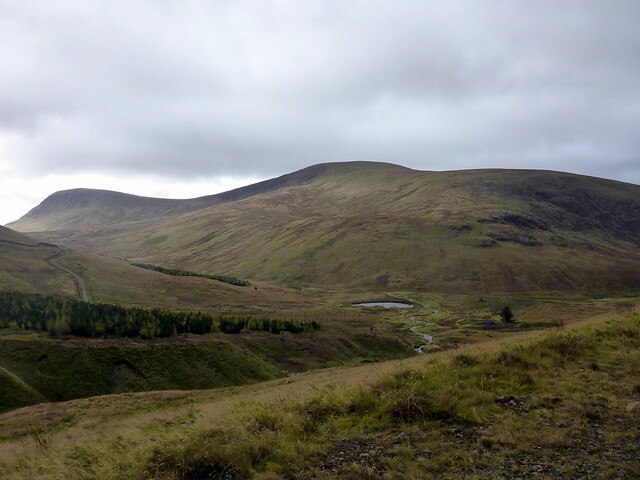 Onwards to Cairngarroch and steeply down through tussocks to the Black Water of Dee - I used the track and bridge to get across. 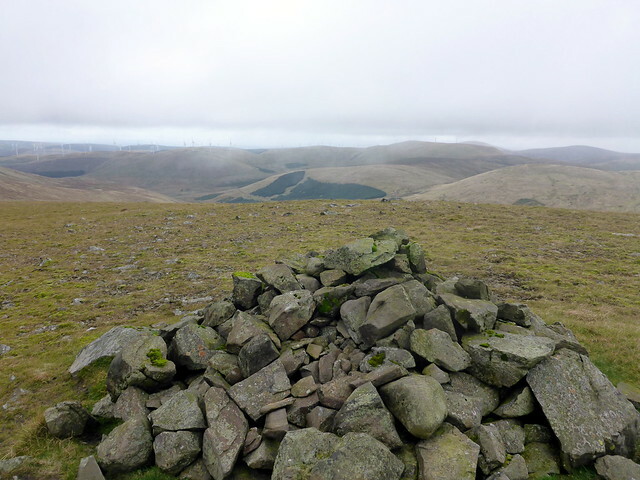 My next target was to get up to the line of hills that ends with Corserine (although I had already done Corserine earlier in the year, so only needed to go as far as Millfire. Up through cleared forest towards Darrou - I was really struggling with the terrain and my ascents were really slow today. 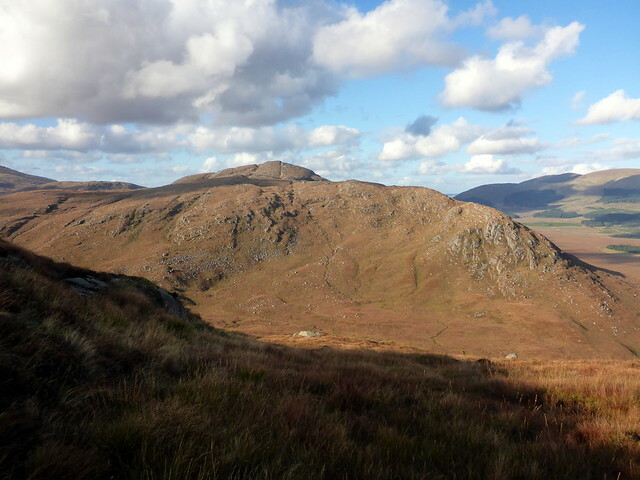 I continued to huff and puff onto Little Millyea then Meikle Millyea where I noticed my GPS was stuck - probably lack of battery power to get a signal. 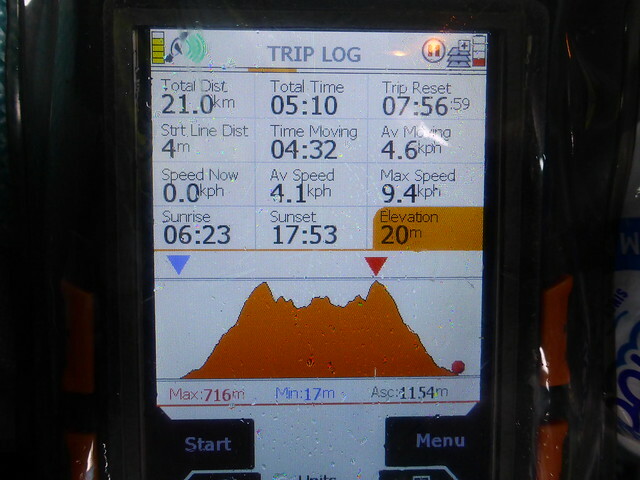 I changed batteries on Milldown (so today's stats don't make much sense). 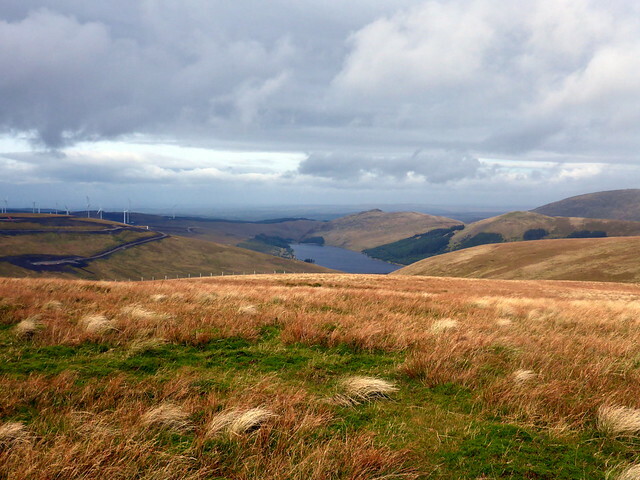 I met a group of walkers doing the circuit from Forrest Lodge. For me it was down west towards the track - I did notice there's a good track running alongside the river just south of Milldown, but it isn't on the map and disappears into trees - no telling where it might end up. 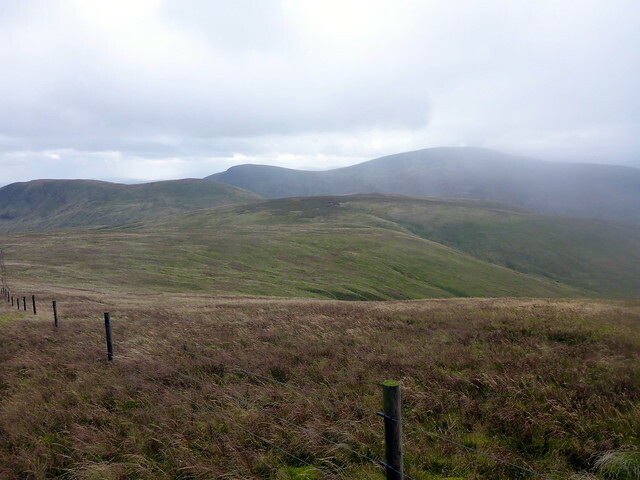 I kept to the hillside, an uncomfortable contour round then descent and onto track. Another quiet night apart from one stag roaring - he was getting nearer and nearer until I started to worry a bit, then he moved off. 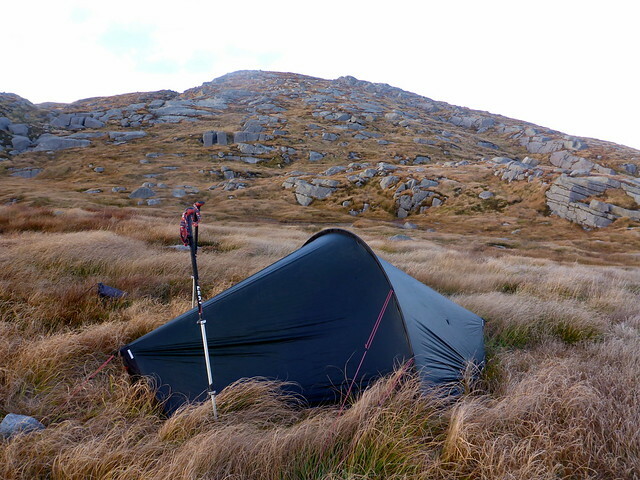 My water bladder was empty on the first sup I took during the night, meaning I had only a small bottle of water for breakfast - not that there would be no opportunity to get fresh supplies during the day!! Rain started at 5am. Oh well - forecast's right then. And so it was. 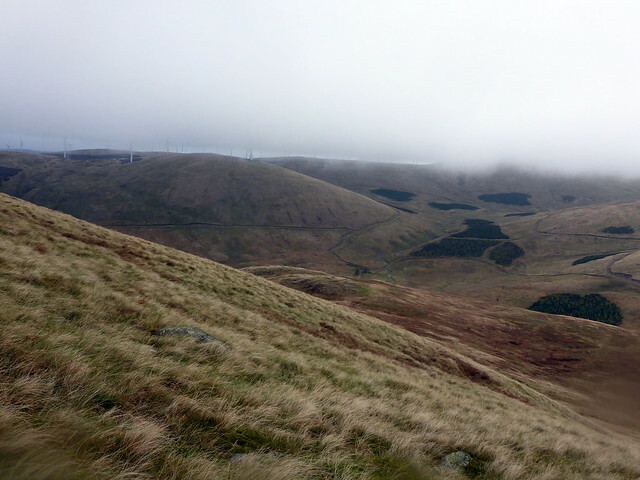 Craignaw is a fine craggy hill, but both times I've been up have been in clag, sadly. [Edit - no, first time was a lovely winter's day with good viz - just shows how memory can trick you!] 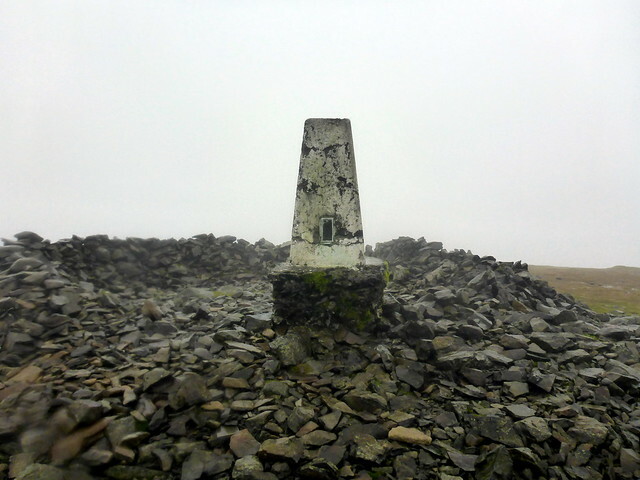 The wind was noticeably stronger than yesterday as I set off and had some difficulty locating the route to the summit, then the way down. 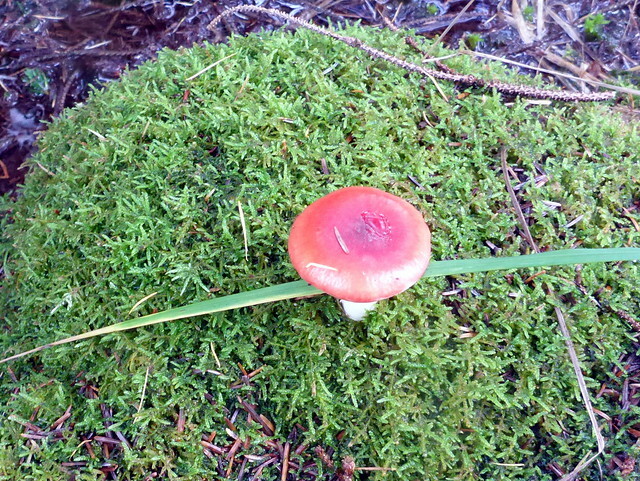 Managed, however, after a couple of wrong turns but I did find a fine spring to fill up on water. 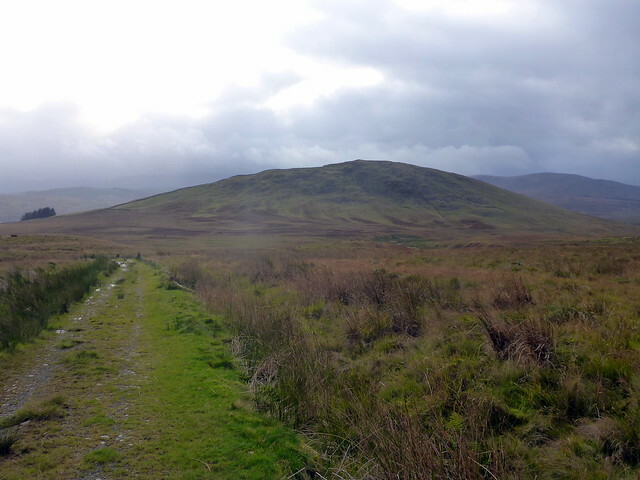 Onwards to Dungeon Hill which seemed further off than it should have been, then down, downto the top of Loch Enoch and Mullwhuchur - another steep slog up and an immediate descent of every metre gained. 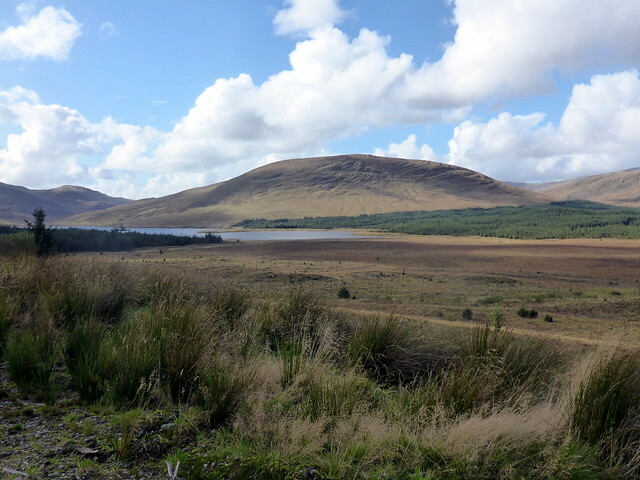 I was now at the Sluice of Loch Enoch, crossed the river easily enough and began the long haul up The Merrick. 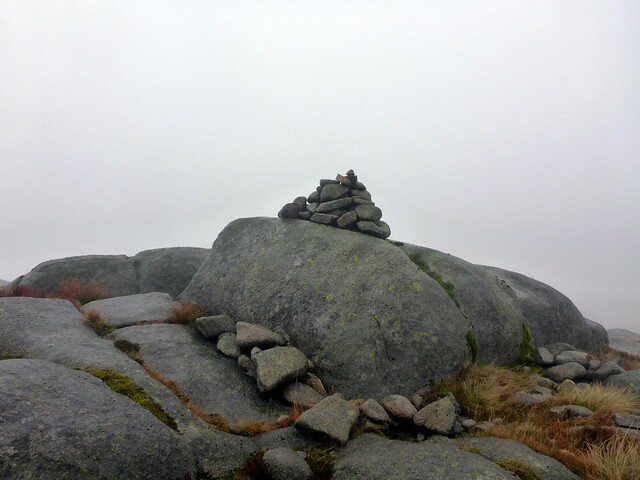 Last time we headed a bit too far north and ran into crags - I was keen to avoid this in today's conditions. 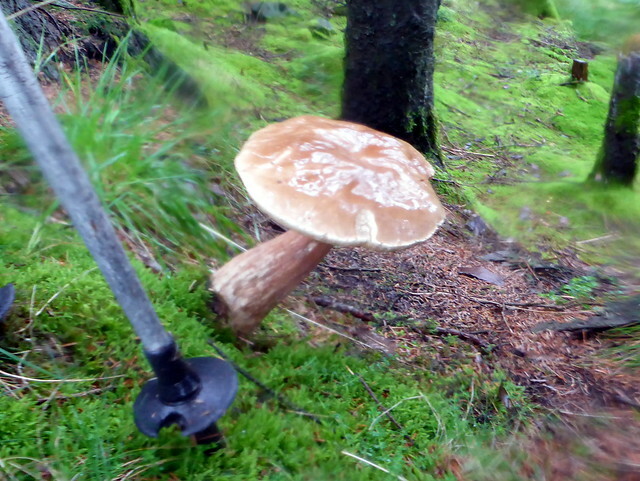 The rain was lashing at me, driven by a strong wind. My secret weapons were a new Mountain Equipment jacket (well I got it at Xmas but hadn't worn it yet) and my first venture into Paramo - a pair of Cascade II trousers. After recent weekends of being wet to the skin, these both gave extreme pleasure, and I was particularly impressed by the Paramo. 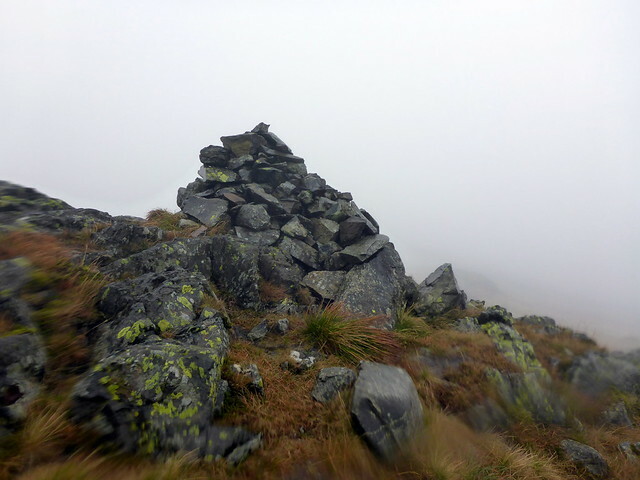 I sheltered behind/under a large boulder for lunch. 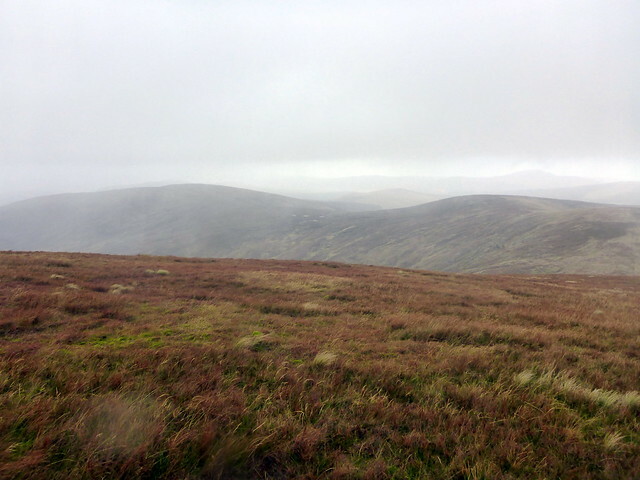 Onwards to The Merrick - the wind now seriously strong as I neared the top. 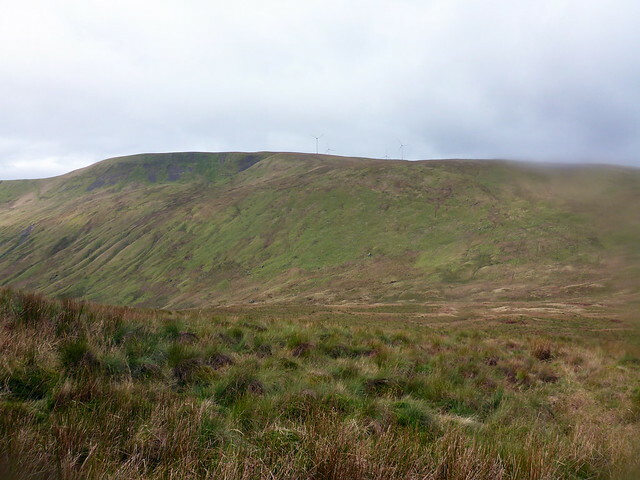 I thought I might have to crawl along the ridge to Little Spear - the intermittent gusts in particular were knocking me sideways. 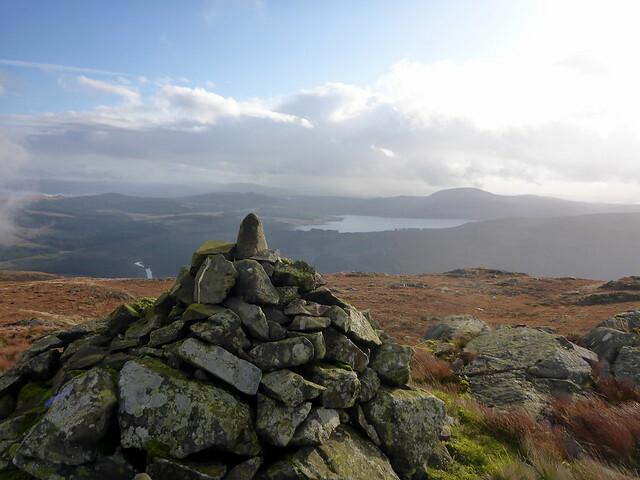 I dreaded the thought of another 9k at high level, across to Kirriereoch and Tarfessock which I recalled as quite tricky in bits with a steep scree-filled descent from Kirriereoch in particular. But I wasn't stopping now. 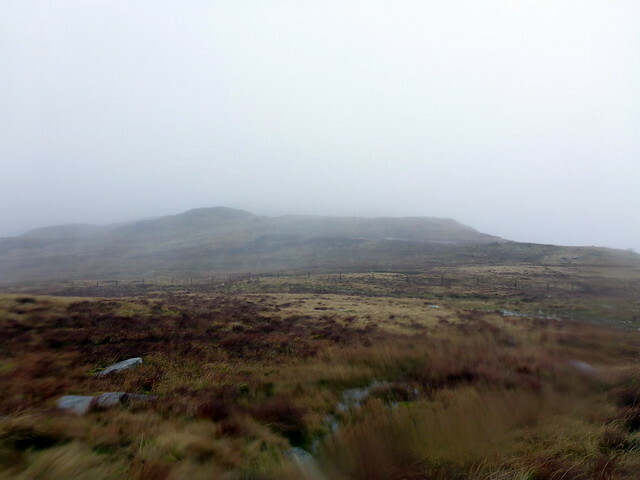 Gritting teeth I pressed on into the gale and clag, rain being driven right into my eyes behind my glasses. Oh what fun! 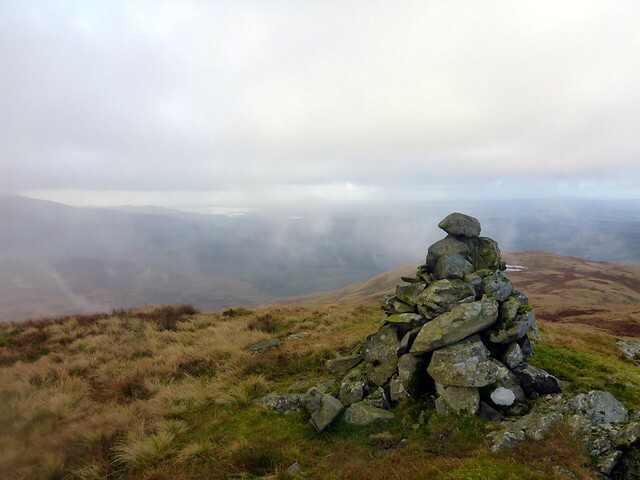 Kirriereoch summit was reached and a faint path picked up (and lost several times) towards Tarfessock. 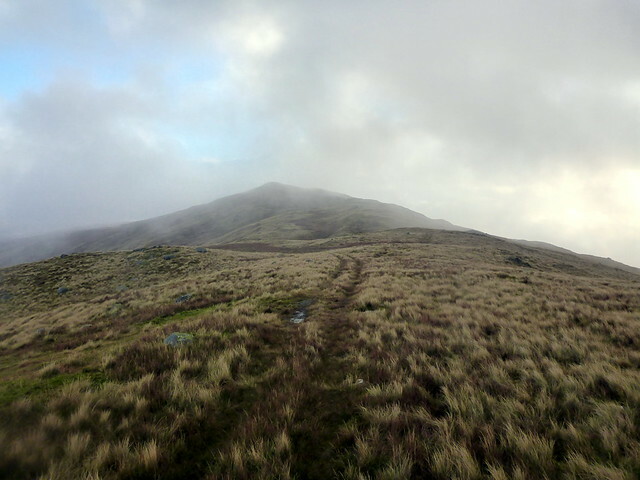 The return journey was a little easier as I managed to follow the path most of the way, hauled myself back up to the Merrick's summit and began the descent down the main path towards the car park. 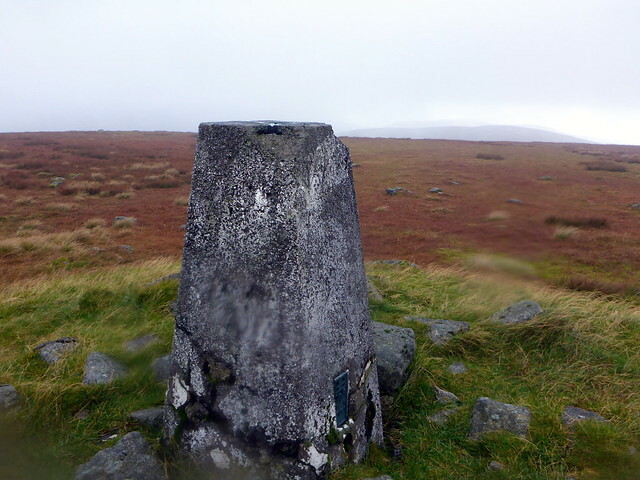 Surprisingly the rain stopped, the wind lessened as I dropped height. I had thought of packing things in and heading home when I got back to the car, but the change in weather inspired me to stick it out. 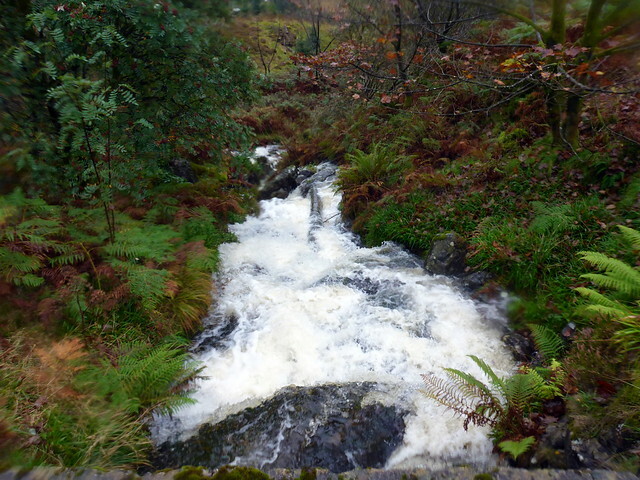 I positively enjoyed the wet journey down a gushing path, past the bothy and through the trees to join the riverside path. 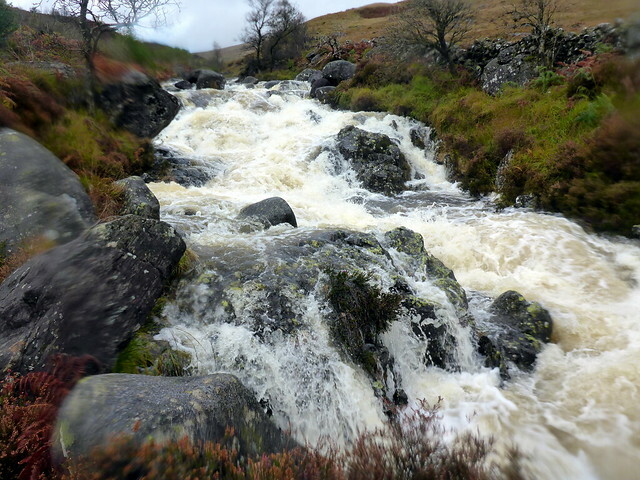 The water white and voluminous in the Buchan Burn - certainly not a day for river crossings. 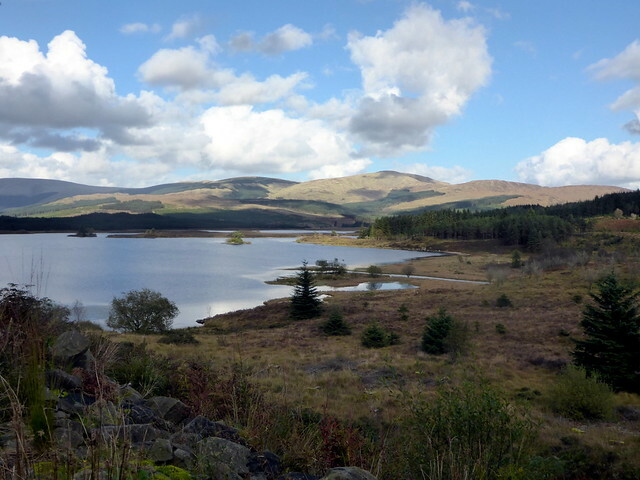 I decided to head to Newton Stewart and Creebridge Campsite, where we've often stayed before. I think I was the only resident in the campsite, which seemed a bit weird, but suited me fine as no noise at night (apart from some nearby cows and the occasional train). Read my book ("The Silent Angel" by Heinrich Boll, set in the immediate aftermath of WW2 in a destroyed German city; nice and gloomy) and had a couple of whiskies to assist sleep. 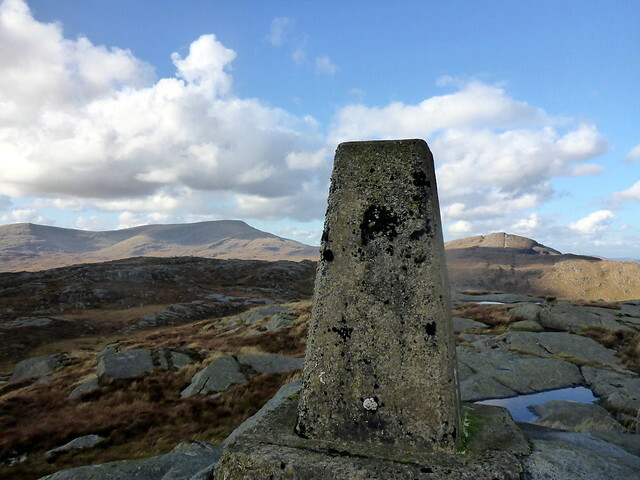 I'd decided I'd do Cairnsmore of Fleet tomorrow, as the forecast was similar for today, and leave the bigger circuit of the Carsphairn Hills for Tuesday. Not a lot of improvement in the weather when I woke on Monday - still strong winds whooshing the treetops around me and the threat of rain. 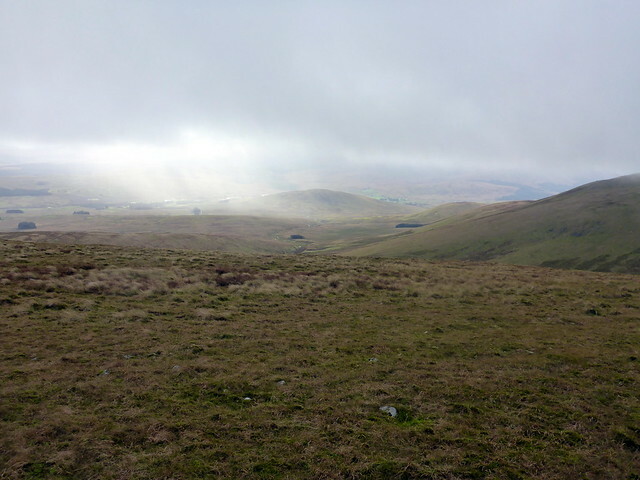 Drove the few miles to the start of the walk near Cairnsmore Farm where there's parking, set off into the elements. 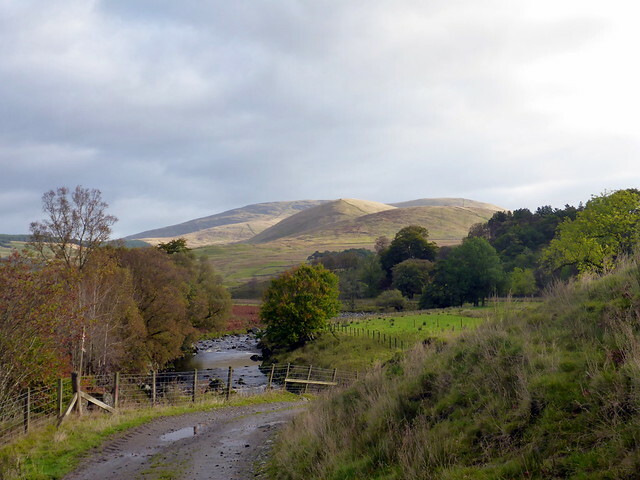 Last time I was here the field that must be crossed before you enter the woods was home to a bull - this time only suspicious sheep gazed at me from their little hill. Up into the woods - the west side of the plantation is in the process of being harvested, bringing light into what was a gloomy corridor. And the smell of fresh cut pine. 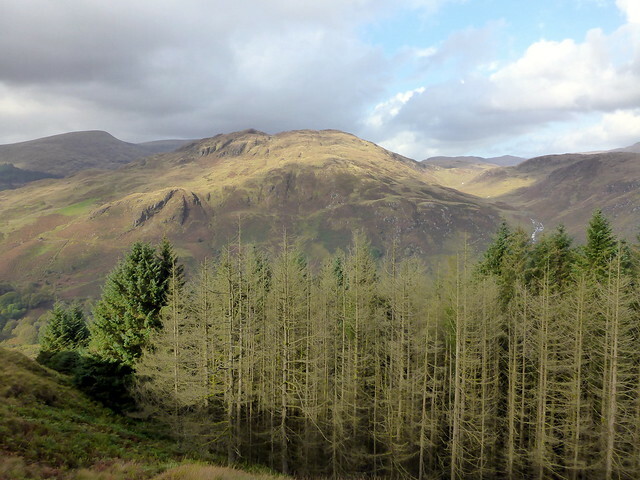 During my time in the woods I was shielded from the wind - however when I walked out of the tree cover the wind and drizzle excoriated me. Another grand day. 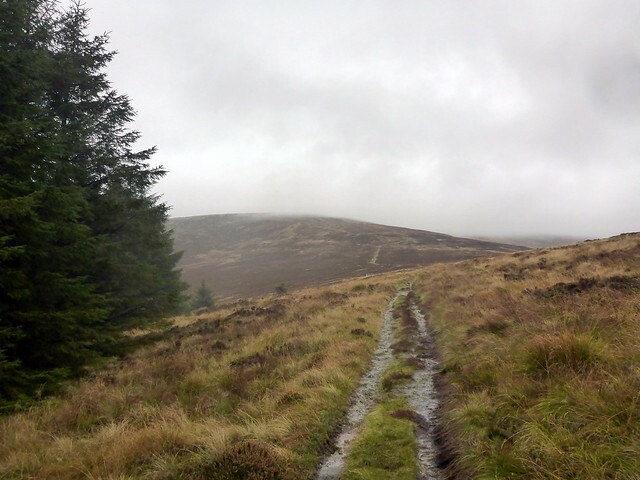 The path up Cairnsmore is large and wet. 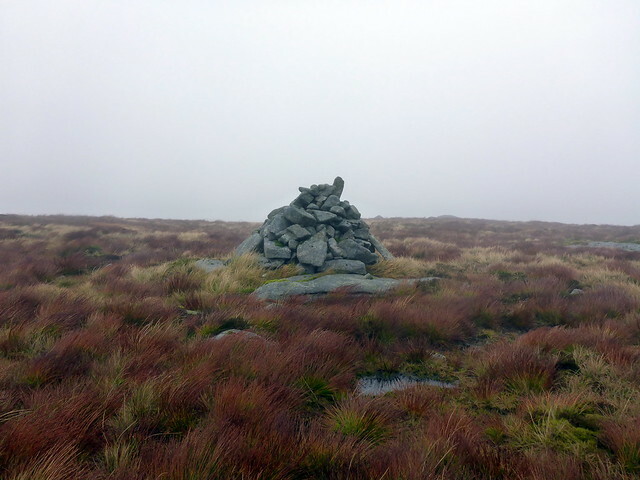 I reached the cairn and took respite in the large stone shelter. 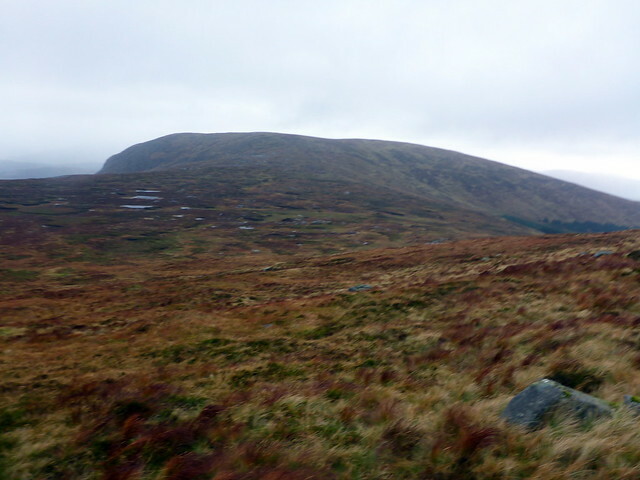 I had intended to continue on to Millfore Hill, a Simm 4km away from Cairnsmore summit. Hmmm. 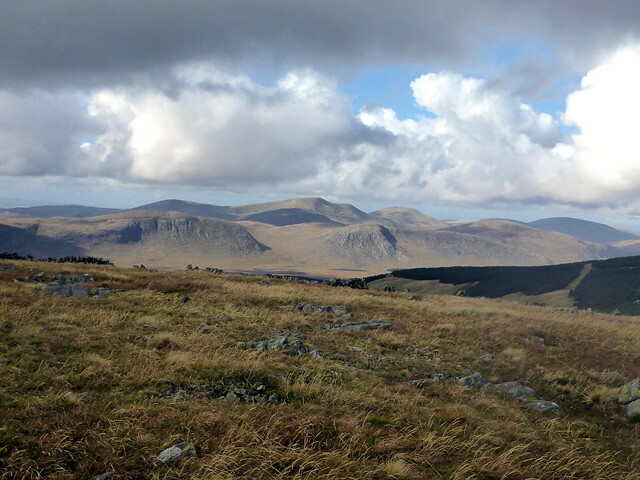 Girding my loins I set off into the teeth of the wind, following ATV tracks down to Meikle Mulltaggart which we'd visited last time, then on across wet grass and intermittent granite pavements beside Coo Lochans before a short climb to the summit of Millfore. 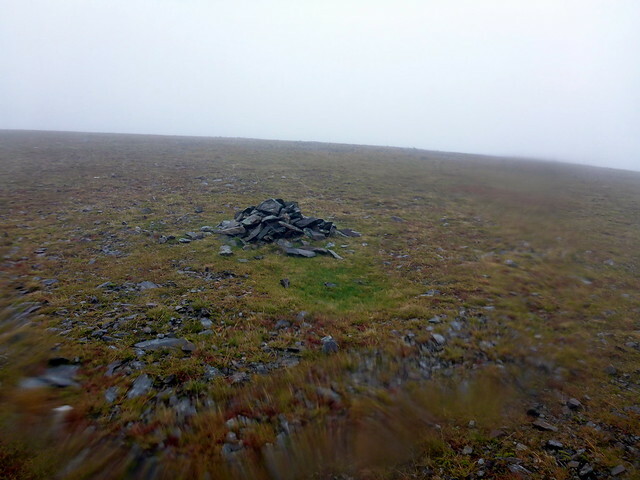 I found enough shelter behind the cairn to manage lunch, then setting off to retrace my steps managed to get disoriented in the clag and wind - not helped by a profusion of cairns near the summit. 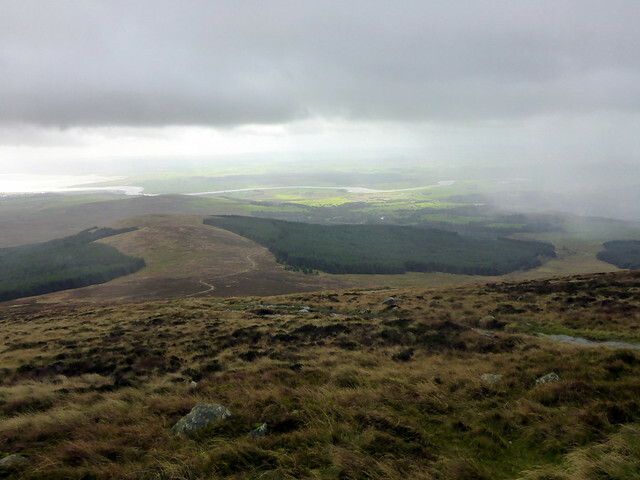 Finally back on track I re-ascended Cairnsmore and trotted down the slippy wet path. 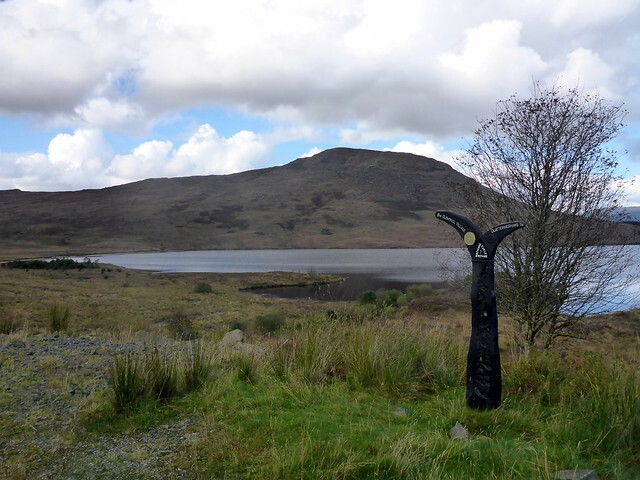 I passed the memorial to the numerous plane crashes on this hill - including a German Heinkel III crew. 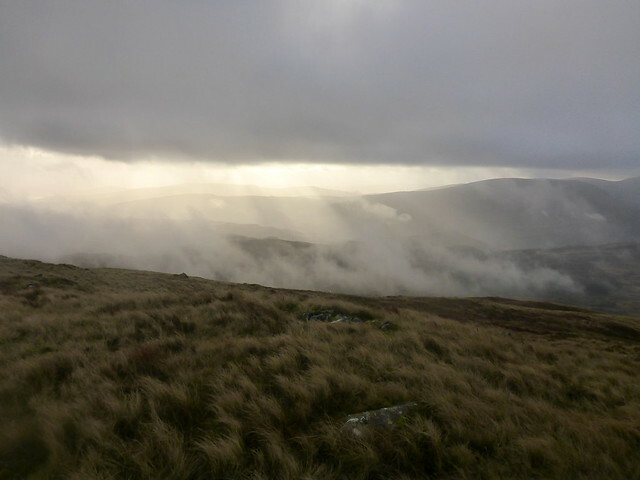 The rain had ceased, at least temporarily and my kit had almost dried off by the time I got back to the car. It was just after 2pm - I nipped into the shops in Newton Stewart then had a wander about, finding myself in the Museum. This is a strange collection housed in an old church, in the custodianship of a couple of lively older women. Lots of agricultural artifacts as one would expect in the area but also some unexpected finds and some interesting info on the aircrashes: the Heinkel had been on a mission to lay mines off Belfast but got lost and hit the hill in fog, at least one of the mines exploding in the impact, killing the crew. It was also rumored that there were so many Avro Anson crashes on the hill as there was an Observer Training Squadron at the nearby airfield: the pilots, bored and frustrated by being kept from active service took unnecessary risks like flying too low. Back at the tent I had my tea and an early night. Up quite early on Tuesday for what was going to be a long day. 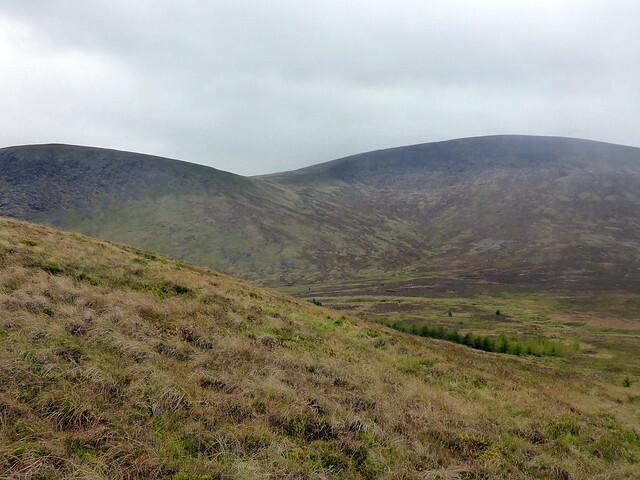 The forecast suggested it would be dry and less windy- I decided to go for the longish route around Carsphairn. Didn't get there til after 9am - driving from Newton Stewart listening to Leonard Cohen's "Live at the Isle of Wight" concert doesn't make for speedy driving - the band came on in the early hours of the last day of the festival, following on from Jimi Hendrix, Mandraxed to the eyeballs - however it's a wonderfully intimate performance in front of hundreds of thousands of people. Arriving at Bridge-end I glanced with mistrust at the sky - although it was sunny there was a large bank of cloud coming in from the west. 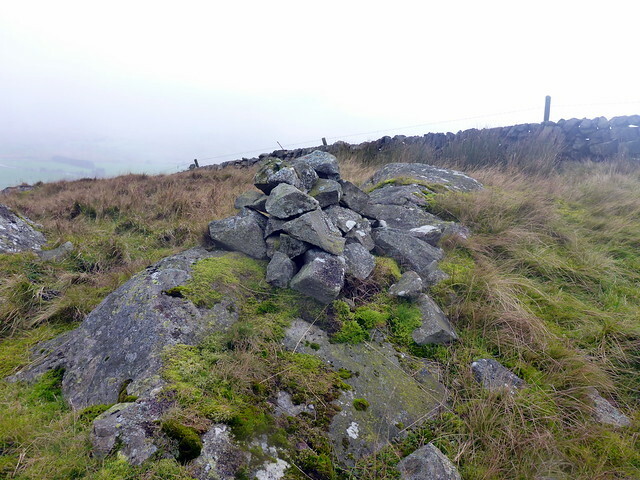 As I marched up the hillside the clag came down, the rain started and the wind was still a considerable force. 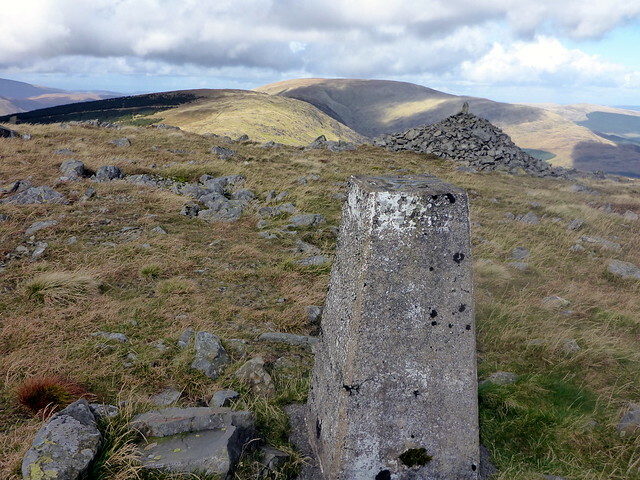 By the time I reached the cairn/shelter at the summit of Carsphairn I was minded to turn back - the thought os another 25 or more kilometres wasn't enticing. 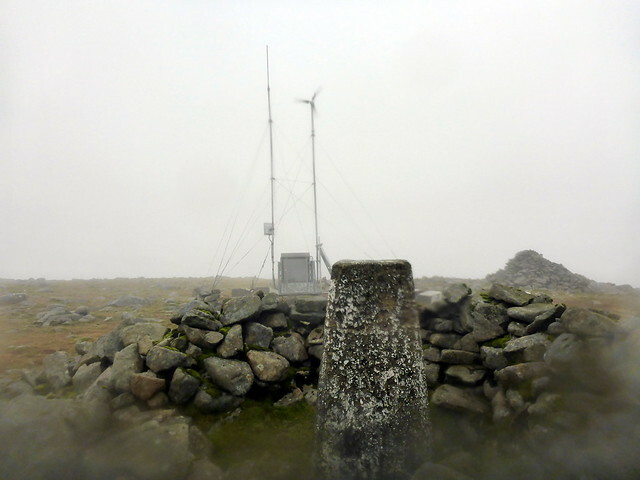 There's a new weather station at the top - the wee anemometer was fair whirring round! 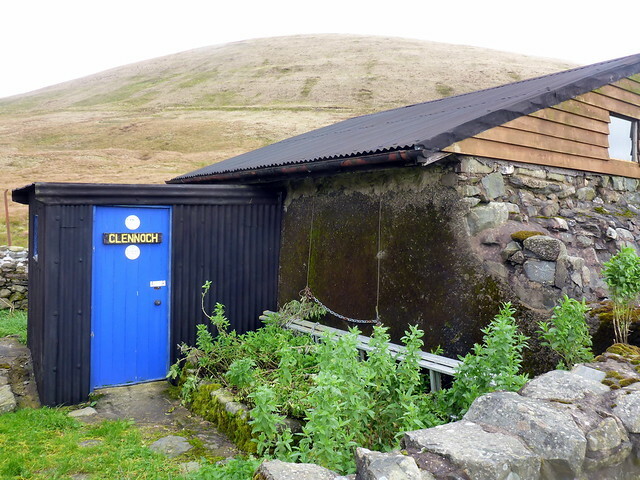 But I kept on - down the gentle slopes to the NE from Carsphairn summit towards Roaring Cleugh (site of a Spitfire crash - interesting article here: - http://www.walkscotland.plus.com/Galloway/pages/ngairycrsh/03.htm) and towards what I found to be the MBA Clennoch bothy - had I known of its existence I might well have chosen to walk in on Monday afternoon and stay here - looks a cracking wee bothy. 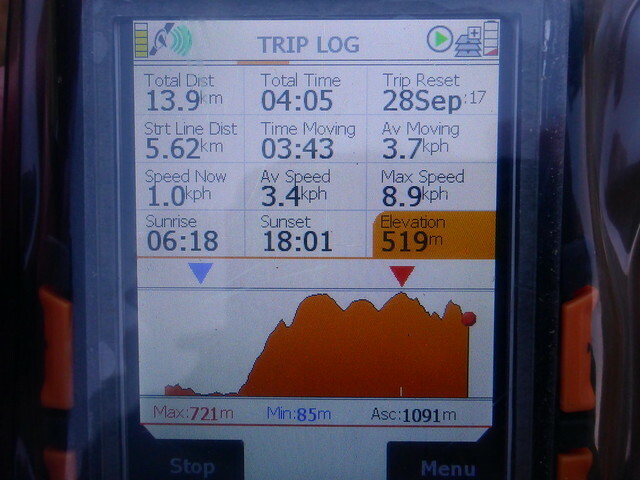 There is a bit of a river crossing to reach it - not bad today though. 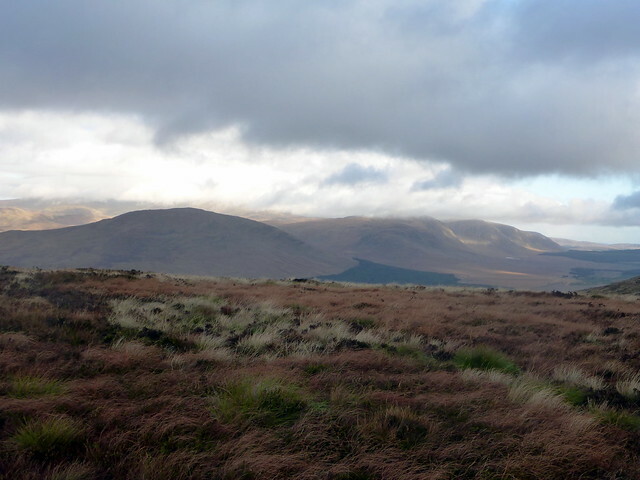 It was too early to stop for lunch so I just had a peek inside then set off to the windfarm track that leads to Dugland (Simm) - a scramble up soft tussocky moss, with numerous field mice scampering between my feet. 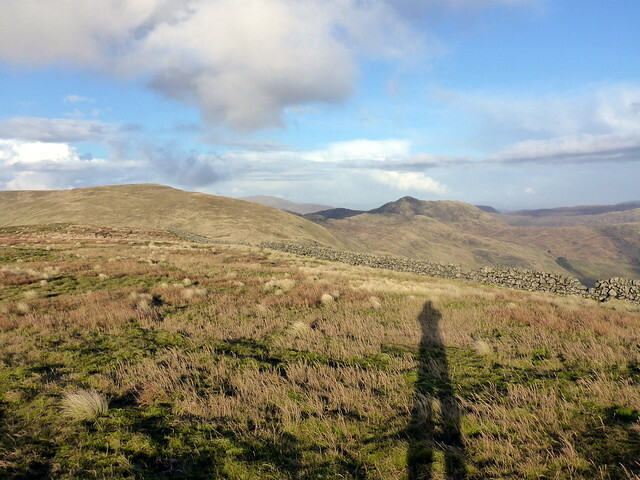 Paused for a bite to eat back on the track and noticed another hillwalker who was marching in the opposite direction - he expressed surprise at seeing another soul today as he went by. 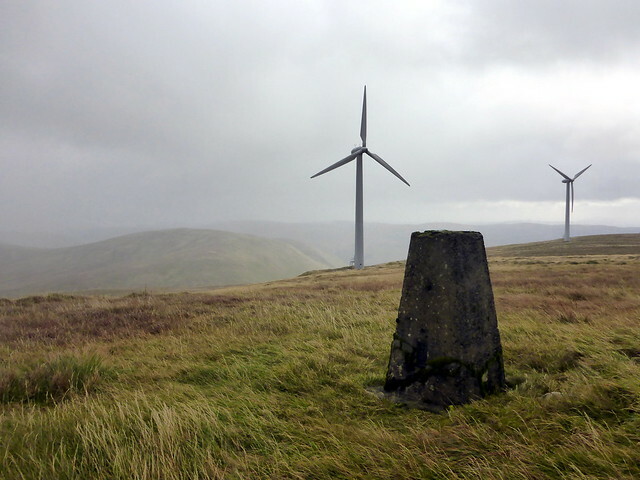 From here it was a walk on windfarm track almost to the top of Windy Standard. I was doing OK for time and seemed to have my usual energy back, which relieved me. 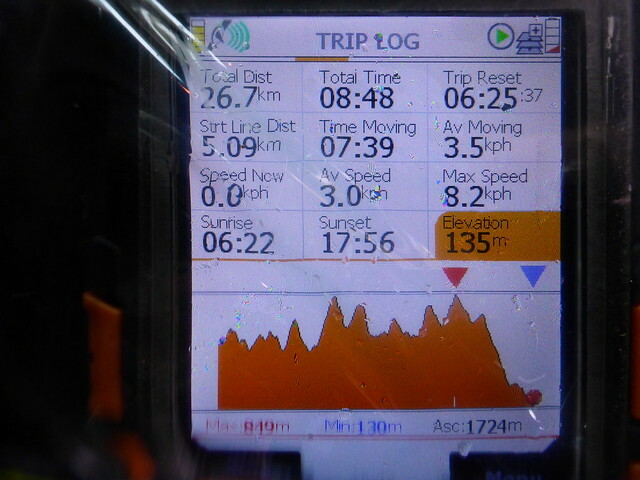 From Windy Standard I faced the out-and-back to Alhang. Mind the electric fence - I didn't notice it at first and got quite a jolt even through my glove - glad it wasn't a more sensitive part of my anatomy! 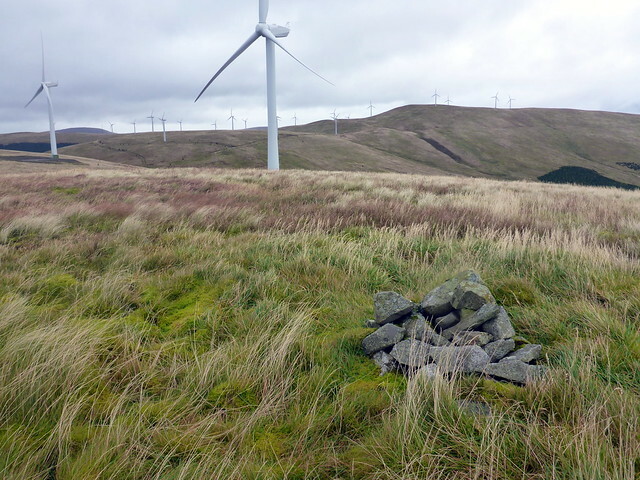 More wind farm works being undertaken on Millaneoch Hill, I noted. 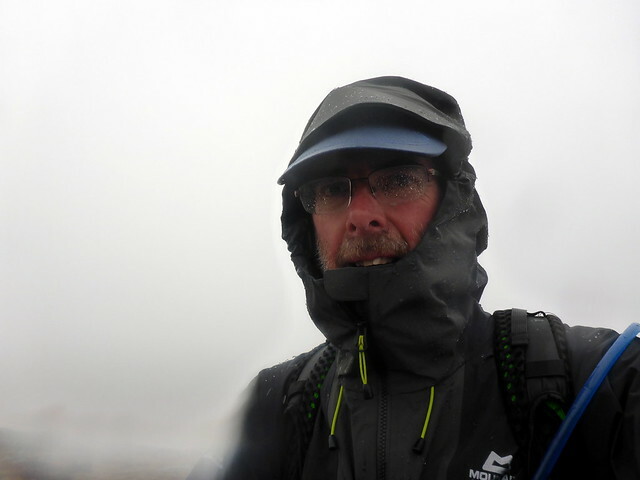 Very wet in the bealach - I remembered this part well from when Allison and I did it - she was nearing exhaustion in snow and had to be force fed marzipan to keep her going. 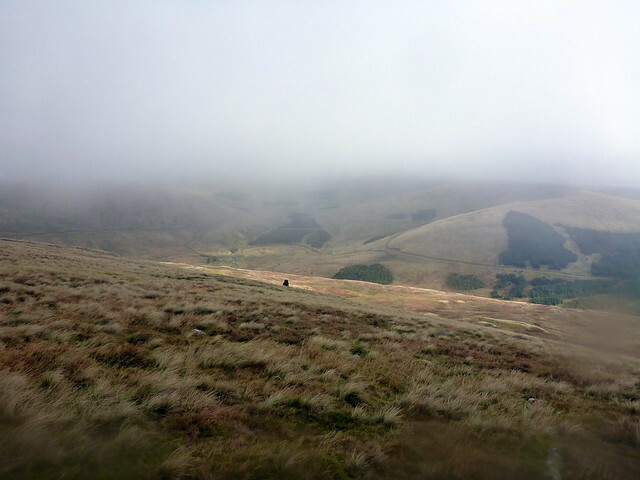 It was an easier ascent than it looked from the col - out to the cairn then back the way I'd come. 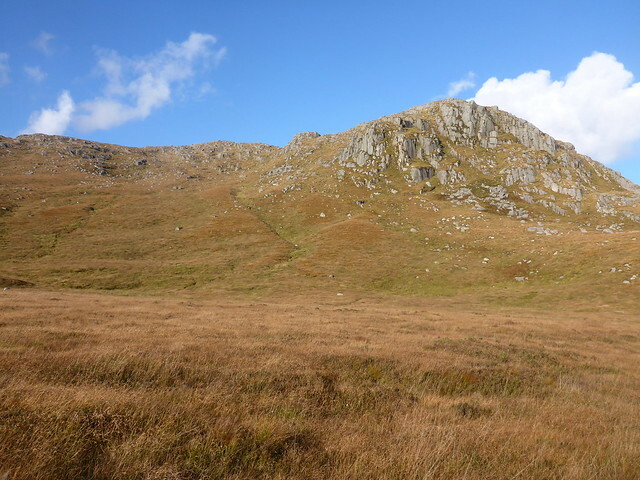 I met the walker from earlier making his way up - he'd come in from Glen Afton and was also on his second round of Donalds having completed his first in 2004. Had a very familiar face. 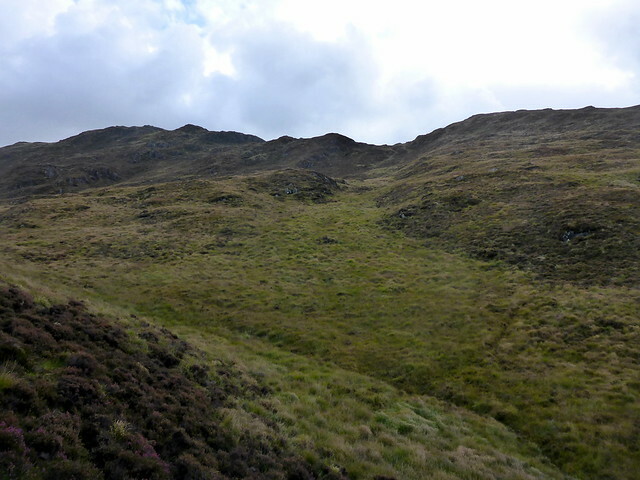 I cut up the hillside southwards towards the Deil's Putting Stone then onto flatter ground, following ATV tracks and making sure I crossed the fences at gates On to Keogh Rig then the short ascent to Moorbrock Hill. Last edited by weaselmaster on Mon Feb 19, 2018 8:55 pm, edited 3 times in total. 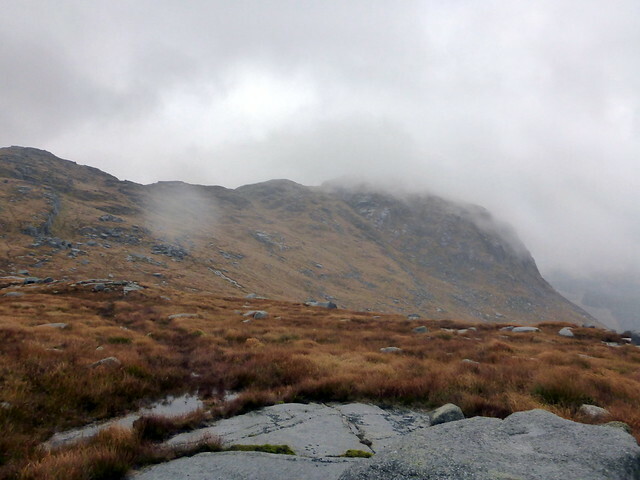 weaselmaster wrote: I met the walker from earlier making his way up - he'd come in from Glen Afton and was also on his second round of Donalds having completed his first in 2004. Had a very familiar face. Ah cheers Dave - I have one of his books living in my car. Seemed a top bloke from our brief chat. was surprised to see the weather station in my report too! Good luck on the second round compleation!